Slow down, block out the rest of the world for a moment, and take the time to consider the following. Have you ever found yourself in a situation where you were waiting for someone to provide you with something, something that you must work on, and in-turn, which you had to pass on to someone else? Someone else who may have also been waiting for that particular piece of work? And it wasn’t as though you had no other work – correct? In fact, it is most likely that you were up to your eyeballs in work, other work – but not the work that you needed at that moment. In fact its quite likely that you were continuing to receive work that you didn’t particularly need or want at the moment, and you were passing on work that others didn’t seem particularly enthused to receive, even if they had been complaining about it only a few days previous. You probably wondered why you hurried. I doubt that there are very many who can’t relate to this. In fact, for many of us, in our day-to-day working lives, it is the rule rather than the exception. It doesn’t really matter if you are on the shop floor or in corporate, manufacturing or services, it pretty much seems universal. Universal or not, does it need to be like this? I hope to show you that, indeed, it does not need to be like this at all. What this short moment of reflection shows is that most of us already have a pretty good intuition for the concepts of dependency, variation, and an understanding of systems and therefore the necessary intuition to find the needed solutions. And really that is all you require to understand the Theory of Constraints. Theory of Constraints is the invention of Dr Eliyahu Goldratt, an Israeli physicist, educator, and management specialist. It’s a business philosophy which seeks to strive towards the global objective, or goal, of a system through an understanding of the underlying cause and effect dependency and variation of the system in question. It is equally applicable to for-profit and not-for-profit organizations for; strategy, personnel, marketing, sales, distribution, manufacturing, design, and project management. This web site is designed to be an introduction to some of the important concepts of the Theory of Constraints and its successful implementation. It is biased a little toward the manufacturing end of the spectrum. But if you run a hospital for instance and can’t see the parallels, then please let me know. (1) Companies that are already very successful (we aren’t making enough money). (2) Companies that are not successful and in need of turnaround (we aren’t making any money). (3) Not-for-profit ventures (we can’t achieve sufficient output with our current funding). In each case we are making insufficient of whatever it is that the organization needs to make in order to be successful. In other words, we are, in some way, constrained. Although Theory of Constraints developed out of for-profit based manufacturing, it has a much broader and more general applicability. People in not-for-profit organizations, or service organizations, or a paper-based transaction will find the principles equally relevant and applicable. Indeed you probably suffer from “flavor of the month syndrome” – and we all do to some extent – then get your very best “healthy skepticism hat” out and read on. But consider, also, that the very existence of something called flavor of the month syndrome must demonstrate a deeper and on-going need or a desire to improve something – our organizations – our working lives. The problem seems to be that we are constantly seeking something out, and constantly being forced to abandon those methods that fail to deliver the results that we seek. Equally, be aware that it is almost 30 years since the beginnings of the solution to the problem that has given rise to the concept of Theory of Constraints, and yet it is still with us (1). And think of just-in-time with its beginnings by Eiji Toyoda and Taiichi Ohno in the early 1950’s, and yet it is still with us (2). What then of statistical process control with an even deeper past extending back to Walter Shewhart’s work in the 1920’s, and yet it too is still with us (3). Why is it that after 30, or 50, or 80 years, these 3 particular methodologies are still with us, offering solutions that are just as valid today as they were at the time of their inception? Think about it. Well all of these approaches are systemic. Note the spelling; it’s not a mistake, systemic rather than systematic. Certainly these approaches are also systematic as well as we will shall see, however, systemic approaches are concerned with the system as a whole, not with parts of a system in isolation. Think back for a moment to the introduction when we imagined that we were stuck somewhere in a process. Did the process look something like this? So we do seem to have an innate systemic understanding but we tend to still break things down into sub-parts. In Theory of Constraints the key to not concentrating on local optima everywhere is described by a special term – subordination. We will return to subordination issues often. We mentioned that all of these methods were systematic as well as systemic. In order to be systematic we need a focusing mechanism to guide us where to place our attention first, second, and so forth. The focusing mechanism for just-in-time and statistical process control is Pareto analysis; the focusing system for Theory of Constraints is the 5 focusing steps which we will describe in full in the page on process of change. Each of these methods while acknowledging the overall system also acknowledges that within the system there is dependency and variation. It is acknowledgement of variation that sets these particular approaches far apart from many other business approaches. Have you ever seen a budget prepared with a target goal +/- some variation for error? I don’t think so. The variation is there without doubt, but it is not acknowledged. And if it is not acknowledged it can’t be managed. In fact, we manage to try and ignore it by consistently estimating on the low side with lots of safety tucked away everywhere. If we have lots of safety tucked away everywhere then once and a while we should exceed our target goal – ever wondered why that doesn’t seem to happen? It seems then that we never get to really know our true potential. Almost by default, because we have defined a system with boundaries of some sort, we have also defined that there must be finite capacity within that system. Usually defined by the slowest step in the process in just-in-time and Theory of Constraints. 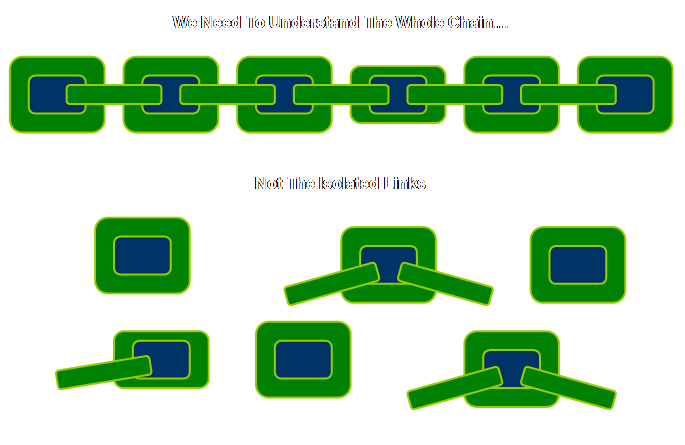 It is sometimes useful to consider this step as the weakest link in a chain. And just as you can ignore the weakest link in a chain, but the weakest link won’t ignore you, so too can you ignore the slowest step in a process but the slowest step won’t ignore you. In other words, regardless of what you do, the slowest step or weakest link will determine the rate or strength of the whole system. Batching is something manufacturing people do – right? Well then consider this. Have you ever heard someone say to you; “Well, we like your idea but we can’t consider your proposal/request until next week when we usually consider these?” Ah, that sounds like batching to me, batching in time. How about; “Yes, we like your idea but we can’t process your application until we have a sufficient number, please put it over there.” Ah, that sounds like batching too, batching in quantity. You see we are all surrounded by batching actions, some so common we hardly think about it at all. Is this important? Well I think so, especially if you consider the comments about dependency and variation. Batching increases the variation in the system and exacerbates the dependencies. Imagine you are a downstream step from a batching operation of some sort. Maybe towards the end of the current batch you are beginning to run out of work, you slow down, it’s important to keep busy after all. But it’s also like the calm before the storm; you know that when the next lot of work is released then suddenly you will have a lot of work on your hands and you will have to work quite quickly to move some of it through. So the work load is variable for no other reason than we had to batch before your position in the process. Variation increases with batching. The batching also highlights dependency. You probably had productive time towards the end of the last batch – that calm before the storm – but you couldn’t use it. It was lost to the system, and now that you are in the middle of the current batch – up to your neck in work – you have no excess or spare capacity to call upon to help you. If only you could have somehow magically stored that capacity from the quiet period and shipped it to the busy period when it would have been useful. So, batching also highlights dependency. (1) Detail complexity – the sort where there are very many different variables to consider. (2) Dynamic complexity – the sort where cause and effect are subtle and the effect over time is not obvious. In operating a process, regardless of whether it is a small job shop or a huge factory, and regardless of whether it contains highly variable human patients or uniform mechanical parts, is full of detail complexity. However the underlying dynamics are limited in variety and not particularly complex. When someone tells you that there are 17 different ways to grind a drill shank they are telling you about detail complexity. When someone tells you there are 3000 stock items, again they are telling you about detail complexity. However, when an action has different effects over the short run and the long run we are really looking at dynamic complexity. When an action has one set of consequences locally and a very different set of consequences in another part of the system, then there is dynamic complexity. When obvious interventions produce non-obvious consequences, there is dynamic complexity. “The real leverage in most management situations lies in understanding dynamic complexity, not detail complexity (4).” Restated; the real leverage in most management situations lies in understanding cause and effect dependency and variation. Let’s be clear then, there is nothing wrong with detail complexity when it is applied to various attributes of products in a process. In fact, you already have the expertise to deal with this; otherwise you wouldn’t be in business. The error, if you like, is when we attempt to apply detail complexity to the process that produces the products. This is the domain of dynamic complexity. We can combine the dynamic and detail complexity concepts of Senge with the global objective versus local objective concepts of Goldratt in a simple 2 by 2 matrix. This is what we get. They represent two different lenses through which we can view our organizations. What if there was a simple way to verbalize and capture the cause and effect which we never directly experience, but which we none-the-less have the intuition for? What if we could overcome this core learning dilemma? Senge proposed computer-based “microworlds,” but what if we could do it on the back of an envelope – pen and paper? There is a mechanism that allows us to verbalize, construct, analyze, and communicate these cause and effect relationships, and moreover, to propose workable solutions to the problems that they cause. This is known as the Thinking Process. Mention of the Thinking Process brings us to the concept of elegance. In the sciences the meaning of elegance is one of simplicity and ingeniousness. An elegant solution to a problem is a cause for considerable respect. Theory of Constraints seeks elegant solutions to problems, rather than sophisticated ones. Elegant solutions are more likely to have broken some deeper core or underlying problem; sophisticated solutions are likely to have addressed a limited number of higher order problems (symptoms) while leaving the underlying core problem unresolved. The solutions may be elegant, but they are also incredibly robust. This robustness means that doing something, anything, which is aligned with the direction of the solution, is most likely to bring about an improvement or movement towards that improvement. In contrast the surest way to fail is to sit around measuring and data gathering and waiting until you are sure your implementation will be perfect. It won’t be perfect because it will never start. Robust solutions can stand a lot of rough handling. The best thing to do then is to do something. If a picture is worth a 1000 words, then please accept the following as a visual summary. Theory of Constraints is a work-in-progress. It continues to evolve into new areas as people discover its broader applicability and it also continues to improve in delivery in established areas as people refine their approaches. Hopefully you have been armed with some key concepts. We want to improve systems. We need to recognize that dependency, variation, and finite capacity exist in these systems. We need to understand that seemingly complex cause and effect occurs via these dependencies, both in time and in space, and this has been termed dynamic complexity. Understanding these features is the key to gaining control and moving our system in the direction that we desire. Let’s have look then at the effect of this on the bottom line. (1) McMullen, T. B., (1998) Introduction to the Theory of Constraints (TOC) management system. St. Lucie Press, pg 114. (2) Ohno, T., (1978) Toyota production system: beyond large-scale production. English translation, Productivity Press, pp 75-92. (3) Lepore, D., and Cohen, O., (1999) Deming and Goldratt: the Theory of Constraints and The System of Profound Knowledge. North River Press, pg 45. (4) Senge, P. M., (1990) The fifth discipline: the art & practice of the learning organization. Random House, pp 3, 23, 71-72. (5) Goldratt, E. M., In: Cox, J. F., and Spencer, M. S., (1998) The constraints management handbook. St Lucie Press, pp ix-xi.